From the award-winning author of the No 1 bestseller, Unravelling Oliver, comes another absorbing, twisty, brilliantly observed story of murder in high places. "Taut, crisp, clear, a storm-warning of a book. It has the eeriness of 'The Turn of the Screw'; but as these screws turn, a mighty tension takes hold. Masterly." Unravelling Oliver is an extraordinary story of psychological suspense and an enthralling portrait of a thoroughly modern monster. Oliver Ryan is a handsome and charismatic success story. He lives a life of enviable privilege and ease with his wife Alice. Enviable until, one evening after dinner, Oliver attacks Alice so viciously that he beats her into a coma..
'Unravelling Oliver' won the Best Crime Novel award at the Bord Gais Energy Irish Book Awards 2014. 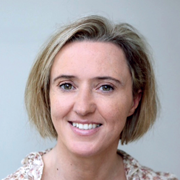 Liz Nugent has spent the last 20 years working in Irish film, theatre and television. For the last decade, she has been an award-winning writer of radio and television drama and has written short stories for children and adults. Liz will be appearing at some upcoming events. Check back reqularily for opportunities to hear her read from her best selling books and meet her in person. I am still the kid with the limp. Except, I really like her now. Lying in Wait is chosen by the New York Post as one of the 25 best thrillers of the summer!